On 4-5 October, Eastern Partnership Civil Society Forum (EaP CSF) took part in 6th EaP Agriculture and Rural Development Panel, entitled “Structural Reforms, Financial Sector Architecture, Agriculture and SMEs – Small and Medium-Size Enterprises” – focusing on structural changes affecting not only agriculture, but rural areas at large. 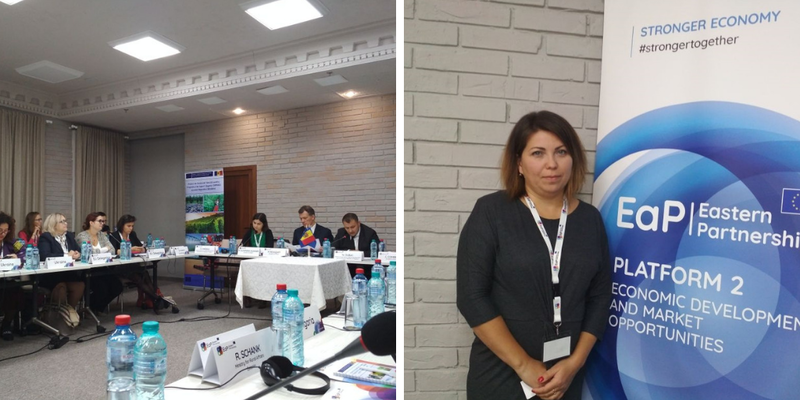 Representing EaP CSF in Chisinau, Moldova Kateryna Shor (Information Center “Green Dossier”, Ukraine) and Vitalii Ziuzin (NGO “Local Strategies”, Ukraine) presented a number of questions on sustainable development, environment and policy harmonisation. Addressing the EU stakeholders present in the meeting, Shor pointed to the fact that in many EaP countries, the focus of agricultural policy remains on food production. In her contribution, Shor gave the example of Ukraine – where despite recent debate on the draft laws on agricultural and rural development policy at the Verkhovna Rada, Parliament of Ukraine, “development is considered only from the point of view of agricultural production – without giving attention to other aspects of rural development, which are laid down in EU policy”. We need new approaches, which would also cover a response to climate change and more holistic views on restoring and preserving ecosystems. Another important intervention at the Panel concerned OECD – Organisation for Economic Co-operation and Development’s Rural Policy “3.0”. The policy includes new definitions of rural areas, dividing them into three separate categories, on a scale of how remote or urbanised they are. Enrique Garcilazo, Head of Regional and Rural Policy Unit, confirmed that the policy is more inclusive – in engaging civil society and giving more importance to rural and indigenous populations. Other presentations drew on the theme of creating synergies between urban and rural areas. In this respect, the Panel also heard contributions from Raffaella Boudron (DG NEAR), Georgios Mathioudakis (DG AGRI) and Malgorzata Lubinska (Ministry of Investment and Economic Development of Poland).